I am back from my leave of absence, it is going to take me a little while to get back into the "swing" of things. I'd like to thank all of you for the thoughts and prayers you have sent our way, they are greatly appreciated. Please bare with me as I try to gather my thoughts and begin my reviews again. Allergic to peanuts or just eager to try something new and different? 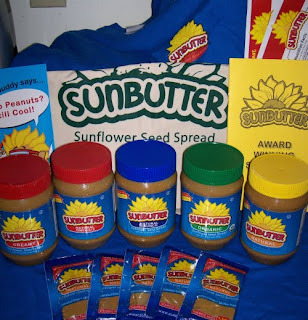 I have been given the opportunity to try a selection of products from SunButter. We go through a lot of peanut butter in our house, this was the perfect opportunity to bring something new into our diets. Did you know that SunButter is rich in vitamins and has 1/3 less saturated fat and 0% trans fatty acid than typical peanut butter products? SunButter comes in a variety of flavors. Once my package arrived, I wanted to display the products and share them with you. Of course, it took all of 5 minutes before one of my children started to beg for the T'shirt and my other child wanted to perform a taste test! Did I give in? Of course! This was the perfect time as they just arrived home from school and needed an after school snack. I placed everything back into the box and chose 2 jars of SunButter for them to try out. We opened the "Creamy" and the "Natural Crunch". The aroma! It was as if we had opened a fresh bag of sunflower seed kernels. We love sunflower seeds in our house, by the way. You could actually see the sunflower kernels in the "natural crunch", it was generously filled with whole sunflower seeds! The SunButter coloring resembles peanut butter and the "creamy" was quite smooth. Though, I'd have to say that "natural crunch" has a slightly darker color. My children eagerly waited for me to give the "go ahead" to begin the taste test. We had spoons and crackers set aside. I liked how smooth the "creamy" SunButter layered smoothly onto the crackers. With peanut butter, I've found that if you don't keep it in the cupboard; your crackers will break or bread will tear. This sunbutter spread on the crackers with ease. It's okay but, I like peanut butter better. I will eat the SunButter on crackers though! I like the creamy but, I really don't like the crunchy butter. The SunButter tastes better without Jelly. This is really good! Can I have it everyday after school? Is this really good for you? Can I have some more? It tastes just like sunflower seeds, I like this better than peanut butter. What do I think about this product? SunButter is delicious! You are suppose to refrigerate this product and I normally keep my peanut butter in the cupboard to keep it smooth. I was skeptical with how the texture would turn out by placing it in the refrigerator but, I complied. That night, I took out the SunButter and grabbed a spoon. I noticed the oils in the jars and stirred the Sunbutter. The texture was perfect! You still had the smooth and fresh taste. Unlike how clumpy and hard peanut butter becomes after being refrigerated. I was able to spread the SunButter onto a cracker with no problems. I'm sure you are wondering what my husband thought of the product. Well, let me explain. My husband Larry is one of the most pickiest eaters I have ever met. Getting him to try new foods can be like pulling teeth! I'll give you an example, did you know that it took me 12 years before I could get him to try Chinese fried rice? Yes, 12 years! He just tried the rice this past July. My husband thought the SunButter had a pleasant smell but, wouldn't try it. He'll come around eventually. Since receiving our package of "goodies", I have since given out all of the sample packets and with the impressive amount of company we have had this past week, I used this product for snacks as well. I've had a mix of reviews from others both positive and negative. Which, this is to be expected with all products on the market, especially edible items. A few family members have been actively seeking stores that carry SunButter after trying the product. You can find SunButter on the shelves of many Organic & Health Food stores around the country. I highly recommend trying this product! SunButter is a healthy alternative to peanut butter and packed full of nutrients your body needs. You could also purchase Sunbutter directly from the website if you are unable to find it available in your area. If you have any questions, please don't hesitate to ask. If I am unable to provide the answers, you can contact SunButter directly from either using their website or by telephone at 1-800-437-5539. I have not and will not be paid for this review. The sponsor generously let me try a product from the company and I have only posted my own personal opinion to share with other readers. I hold no responsibility between you and the sponsor, and/or products you may purchase or receive from them. I never heard of them until I read this. I am looking for new products that taste great and healthy. I plan to look for it in my health food store. Thanks for the review!